Warlords didn’t change a lot for Retribution, Holy & Prot got the lion’s share, but a few abilities were hacked and others moved. See the links just below the contents if you’re interested in other Paladin guides or PvP. 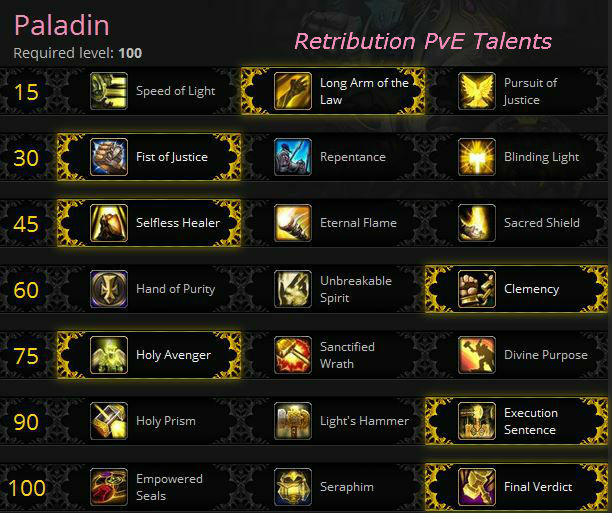 This guide to the Retribution Paladin is primarily intended for use at level 100 in a raiding environment. However, the same principals will still apply during the leveling process, so if you’re looking for advice on leveling your Paladin, check out our Paladin Leveling Guide. Different talents will work better in different situations.For example, one one fight you might want burst movement (Speed of Light,) but for the rest maybe Pursuit of Justice will be better overall. The picks below are for general raid content, but feel free to change them for your game or for specific fights. Use the proving grounds to experiment with talents. Those same proving grounds are a requirement for random LFR and random Heroic dungeon groups in Warlords of Draenor. Movement choices. Do you want burst movement or a general increase? These do not stack with other movement speed increases, such as the speed boost from boot or cloak enchants. Speed of Light is grants you a burst movement cooldown, a good choice for situations where you suddenly have to play “catch up.” 8 seconds of sprint with a 45 second cooldown will help you stick to the target. Especially when it dashes over there. Long Arm of the Law is a 3 second boost when you drop the Judgment hammer. It is good for fights where frequent shorter bursts of speed are needed. This can help you stick to mobile targets. With a very short cooldown this makes for a lot of sprints. Pursuit of Justice has the advantage of being passive (not taking up a keybind,) but just doesn’t offer the speed burst of the others. It’s just a nice, steady movement increase which isn’t bad at all. Crowd Control. Do you need a single target stun or an area effect for add groups? Fist of Justice is an improved version of Hammer of Justice, longer range and shorter cooldown, a single target CC. Stuns are always good and work well as interrupts. Repentance is a single target CC that lasts longer than Fist of Justice and has a shorter cooldown. It breaks on damage, but is good for incoming adds. If you’re on “add duty” then it’s a nice choice. Otherwise, take the Fist. Blinding Light disorients everything withing ten yards for 6 seconds. Nice for add groups and trash. You’re DPS, not a healer, but sometimes being able to aid an ally is valuable. Do you want to use Flash of Light or cast a Shield? Selfless Healer is good if you want to throw out emergency heals from time to time, on others or on yourself. Let it stack up and then get a quick and decent heal. Your team emember gets in trouble and you can give him some help. Eternal Flame isn’t great when used on others, but it’s pretty sweet when used on yourself. Nice for those incoming damage phases. The only issue is that it uses your Holy Power and is a DPS loss. Sacred Shield is the talent you are looking for. It can have considerable uptime with minimal effort and absorb a pretty fair amount of damage. This will make it an even better choice than before. It does not use Holy Power. Haste speeds up the effect. Kind of a “meh” tier for Retribution DPS, but there is some nice support stuff here. Hand of Purity is for encounters with particularly detrimental periodic effects, though it does provide some baseline damage reduction and so has some general value. Unbreakable Spirit is very nice for certain fights, such as the ones that quickly kill Ret Paladins. It reduces the cooldown on Divine Shield, Divine Protection, and Lay on Hands by 50%. Depending on your role (and how often you use those abilities) the changes might well make this the pick. Clemency is likely to see the most use of the three options in this tier, if you’re making good use of your hand abilities. If you figure you need your emergency abilities more often (eg: Lay on Hands, etc.) then go with Unbreakable spirit. All are good picks and over a long fight the DPS gained from all with be very close to each of the others. With the tier 17 set bonus (see: Battleplate of Guiding Light) Divine Purpose is the best pick, due to more effective Hammer of Wraths and yet more Holy Power generation. Sanctified Wrath causes your Avenging Wrath to last 50% longer and grants more frequent Hammer of Wrath usage while it’s active. Divine Purpose is useful, but random. It will let you cast more of your Holy Power abilities and will help keep your DPS up inbetween burst phases. If you’re fine with random procs, not wanting to deal with fussing with cooldowns, then this is a good choice. Area effects or single target DPS? Holy Prism is one of two AoE DPS options in this tier, but it’s the weaker one. It is, however, nice when cast on the tank to help her sweep up adds. Light’s Hammer is the other AoE option, the choice between it and Holy Prism depends on the exact nature of the fight more than anything. Generally though, the Hammer wins, and is better than Execution Sentence anytime you’re fighting two or more opponents. Execution Sentence is the best choice for single target DPS, if your target is going to stay put for the whole ten seconds. Keep in mind the damage and healing ramp up over that time, so it’s most effective at the end of the period. Empowered Seals: Your Seals also cause your Judgment to provide additional effects. This restores some effects that were removed from Judgment awhile back. Each effect lasts 20 seconds. A bit redundant with some other talents, but that Attack Power is nice and since you’ll be using Seal of Truth anyway, all the time, it’s a good pick. All effects last 20 seconds and Judgment has a 6 second cooldown, so this can be up all the time. It is not a DPS gain over Final Verdict, but might be more fun and it’s certainly more challenging to use well. Seraphim: All of your secondary stats (Haste, Crit, Mastery, MultiStrike, and Versatility) all get increased by 1,000 for 15 seconds, with a 30 second cooldown. Line this up with Avenging Wrath and/or Holy Avenger. Final Verdict is still better. Final Verdict: A mighty strike, doing all of the damage as Holy. It also increases the radius and damage of your next Divine Storm, both by 100%. Replaces Templar’s Verdict. This is the best talent for single targets. In Warlords the only real Glyph Changes are that you now learn several automatically, just as you do with your abilities. They are not installed, just learned, whether you want them or not. Glyphs are pretty situational. For best effect you’ll be doing some swapping, so keep some Tomes handy. Major Glyphs, more or less in order of usefulness. Glyph of Templar’s Verdict – Take a little less damage after using TV or Exorcism. Dead Paladins do no DPS. Makes your healer’s jobs a tiny bit easier. Glyph of Double Jeopardy – useful if fighting two targets, does nothing against single targets. Minor DPS increase when fighting 2+ targets. Glyph of Mass Exorcism – Primary target takes full damage, all other targets take reduced damage. Recommended if you’re fighting stacked groups and don’t need the range. Glyph of Divine Protection – reduces magic reduction of DP by 20% but adds 20% physical damage reduction. Useful for fights with lots of group-wide magic damage. Glyph of Harsh Words – Your Word of Glory can now be used in an offensive manner. Glyph of Word of Glory – If you’re using WoG then this looks pretty interesting. Glyph of Avenging Wrath – Heals you up for 10% of your health over 20 seconds while AW is active. Glyph of Divine Storm – heals caster for 5% max health. Glyph of Hand of Sacrifice: Hand of Sacrifice no longer transfers damage taken by the target to the Paladin. This means that the Hand now puts a shield on the target, making things somewhat safer for the Paladin. There is a very similar to the Warrior’s Vigilance ability change. Glyph of Righteous Retreat – Bubblehearth. Is your group just awful? Then bubble and out. Glyph of Focused Wrath – Your Wrath only affects one target. In Warlords of Draenor the Hit and Expertise stats are dead. So if Reforging. To replace them you have two new stats: Versatility and Multistrike. Your Str no longer adds to Crit, but you have a base 5% to start with. You also have an “Attuned” stat. This is the stat that Blizzard feels will help you do the most damage overall. In your case it’s your new level 90 Righteous Vengeance. Note that the value of these stats, Mastery through Haste, is very close. This means this if you have “a bit too much” in one or the other you won’t be kicked from the guild. Probably. What it really means is that unless you’re absolutely perfect with your rotations you won’t see a difference in your DPS. Strength improves all of your damage. It’s a straight up add to everything you do. Mastery causes various of your strikes and their Multistrikes to do additional (holy) damage. It’s a nice, straight up, damage add. Multistrike gives you a chance to do one or two additional strikes at 30% effect. These can Crit and are affected by your Mastery. You should pick one or the other of Multistrike and Crit as you’ll get better effect than by picking both. Note that the chances of actually getting those two multistrikes are pretty low. Crit gives you a chance for a harder hit. You Mastery adds damage and those hits can Crit, as well as any Multistrikes, which are also added my Mastery. So these three work very well together. You should pick one or the other of Multistrike and Crit as you’ll get better effect than by picking both. Haste speeds up everything you do, including cast times, and reduces global cooldowns. Reducing the cooldowns leads to faster Holy Power generation. Versatility “Increases damage, healing, and absorption done. Reduces damage taken.” So overall it’s a fairly useful stat, the others are simply better for overall Damage. Seal of Truth should be your seal of choice for single target fights. Your Str potion can be taken right before combat begins and again at some point during the fight. The key to maximizing your damage is proper management of Holy Power. Crusader Strike, Hammer of the Righteous, Judgment, Exorcism and Hammer of Wrath are all attacks that build Holy Power. Templar’s Verdict, Divine Storm use 3 HP and Word of Glory uses from 1 – 3 charges. As we can store up to a maximum of 5 Holy Power and our abilities utilize 3 charges at most, you can use this to pool Holy Power for when you’ll receive a damage boost and then unleash a quick Templar’s Verdict followed by any attack that generates Holy Power and then another 3 point Templar’s Verdict. However, it’s also important that you never waste an opportunity to build additional Holy Power, which means you need to expend it as quickly as possible upon reaching the 5 stack cap or else you’re effectively wasting potential damage while inhibiting yourself from building further charges for future attacks. Exorcism should be used on cooldown and whenever The Art of War triggers. Hammer of Wrath should be cast whenever possible, either when a target is at 20% health or when Avenging Wrath is active. Templar’s Verdict is your primary Holy Power using attack and should be used when you have 3 Holy Power unless you’re pooling Holy Power temporarily. When facing multiple targets, Hammer of the Righteous becomes your primary Holy Power generating attack and Divine Storm your method of expending it. Target switching is necessary to get the optimal effect from Seal of Truth when facing multiple enemies by placing its censure effect on all targets. Seal of Righteousness is an effective alternative for large groups. Avenging Wrath should be used on cooldown, and will allow you to cast Hammer of Wrath for the duration of the buff regardless of the health of your target. Rotate Judgement > Exorcism > Crusader strike until 5 HP. 13 and 14 are your first and second trinket slots and this macro fires them both. Gems sockets are actually few and far between, they have a (small) random chance to appear on Raid gear and other gear. The gems themselves are actually available. They are all prismatic, meaning they fit into any socket. None have Str, they all have secondary stats (Mastery, etc.) There are no Meta sockets or gems. Older (Mists of Pandaria and earlier) gems work until item level 600, but the item squish cut them down a bit. What used to be 160 Int is now 10, for example. The new Prismatic gems are 50 points of Mastery or whatever. In Warlords: Gem for Mastery, it’s that simple. You DO want to match gem colors for the socket bonuses. In Warlords gem for Mastery, period. Helm enchants are gone in Mists of Pandaria, shoulder enchants all come from the Inscription profession. Your Plate Bonus adds to all Str enchants. In Warlords there are only enchants for your neck, ring, cloak, and weapon items, none for other items. Earlier enchants still exist, but cannot be applied to an item higher than ilevel 600. The Warlords enchants can be applied to lower level items and will scale down appropriately. Mists: Enchant Weapon – Dancing Steel: Sometimes increases Str by 103. All food buffs last one hour and provide only one stat. Foods are available that provide secondary stats, but they’re only worth about 200 points of Str and you don’t need the Stam.Foods and potions should be cheap enough on the Auction House or you can get a guildie to make them for you. If gold is an issue then go here.Your Plate Bonus adds to all Str consumables (and any other Str item. )Note that Pandarens get twice the food buff. Warlords note: There are no new DPS Elixirs, but there are for Potions and Flasks. There are no Str foods, either. Elixirs – you can have one battle and one guardian elixir up at a time. You flasks are much better. Runescroll of Fortitude III: 8% increased Stamina to your entire group. Oralius’ Whispering Crystal: +200 to all stats. Yes, I know you want to play an Undead or Gnome Paladin. Sorry, it ain’t happening. Not even Pandarens can be Paladins. As far a DPS abilities, none of the races really stand out, but some have useful abilities. The best? Draenei for the Str increase and maybe Human for the Versatility increase. Tauren for the hugs. Blood Elf – Best hair, subject to off-color jokes. Arcane Torrent is a worthwhile ability. Somewhat redundant with Rebuke, it’s an area effect interrupt/silence, which is definitely useful when fighting groups with casters. It’s not a PvP interrupt. The mana gain from AT is minor. Good with Enchanting, if you’re taking that skill. Draenei – They’re massive enough, the males, so certainly look the part. 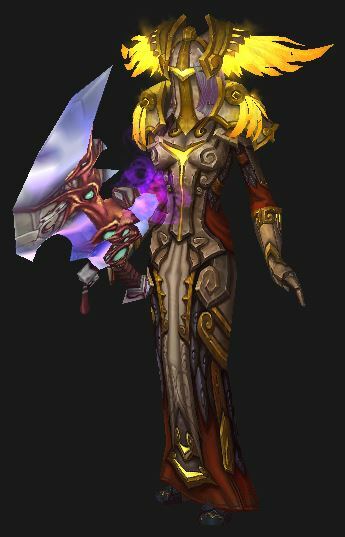 Best Pally race? Their Heal might make some difference on occasion, but it isn’t important to you. Good with Jewelcrafting, if you want that skill. Dwarf – Short, best beards in the game. The Stoneform ability reduces damage by 10% in addition to washing away bleeds and such. Probably more PvP value than PvE, but then there is a lot of raid wide damage in most raids these days. 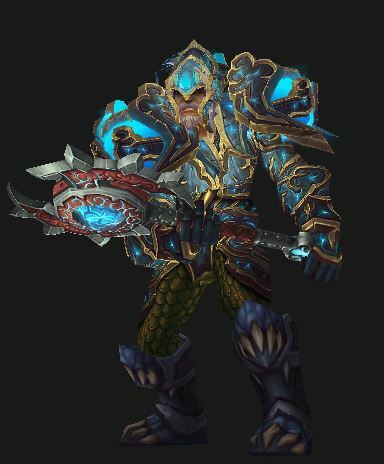 Human – Best Pally race overall? The escape ability has occasional PvE use and will trivialize some mechanics/gimmicks. In PvP it allows the replacing of the PvP escape trinket with something that adds stats. Diplomacy is very nice if you’re going to be doing any rep grinding, but obviously won’t add much to your DPS numbers. 5% health bonus is always nice, but probably more useful for PvP than PvE and it doesn’t scale well at very high level. Still, it amounts to at least three Stam gems worth of Health. War stomp is an Area Effect stun which is, again, probably more useful for PvP than PvE, but should help with some crowd control when fighting anything less than a boss. Good with Herbalism, which is a nice cash skill and adds a Haste & Heal effect. Warlords of Draenor has slain all profession bonuses. No more fine, self only, gems from Jewelcrafting or gem slots from Blacksmithing. The value of the professions now is in making your initial raid gear and a useful item or two. You can also use that starter gear at level 91, which is pretty nice for Draenor leveling or dungeons. Check our wow gold tips for info on increasing your cash flow and maybe making some extra gold with your profession. Alchemy – You can create a nice trinket which will add to your Mastery, sometimes add Str, and also increase healing done to you. The ability to turn into a dragon (if you have lots of gold and the Archeology skill) is also fun. Blacksmithing – Can make your starting Raid pieces (you can equip only three,) keys, sharpening stones, and a few other interesting items. Enchanting – Can enchant neck items, rings, weapons, and cloaks with Draenor enchants. Engineering – All kinds of fund things, such as Razorguard Mechshades, rockets, shields, gliders, essential raid items like the Blingatron, and so on. Inscription – You can make glyphs, of course, and a number of other useful items. Jewelcrafting – Create useful rings, neckpieces, mounts, ans the usual gems. Leatherworking – Nothing to see here, move along please. Well, the Drums are rather interesting. Tailoring – Can make yourself a flying carpet. Gathering – Mining, Herbalism, and Skinning are best used for gold or for supplying a crafting profession. If you’re leveling your Paladin, with the intent of reaching the end-game Retribution goodness, then you need to know that the fastest way to get leveled is with an semi-automated Paladin leveling guide (it doesn’t actually play the game for you.) Even if you boost to 90 you still want to zip through those last ten levels, right? 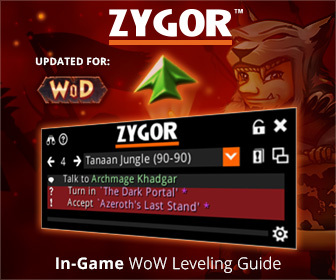 Zygor’s guide is our preferred leveling guide. It’s an in-game guide that shows up as a small window on your screen. It shows the current quest and displays an arrow pointing the way to go, showing you the most efficient way to knock out the most quests in the least time. What? You want to do a few dungeons and/or clean up the Battlegrounds for a few levels? No problem. Zygor has been gemming and gearing for Int and is smart enough to figure out where you are and where you need to go, no matter what level you start with or how many you gain in the dungeons. Watch the video on his home page and he’ll show you exactly how that works. Zygor’s Guide is much like having a skilled partner helping you out every step of the way. Its fully updated for for all the lastest patches and expansions, including Warlords of Draenor. Grab it now and cruise to the level cap. Then you can be the one to answer the “Where do I go at level…?” questions in the chat channels. Get your copy here or read our Zygor review first. Like this page? How about recommending or sharing it and/or commenting? Doesn’t that statement run counter to what you say in the reforge section? Nice catch. That was old info, from the days when Haste was bad. I’ve updated it. Thanks. Speaking of updates, a 5.2 update is coming soon. Love the guide, just one question. You say both hit and expertise to 7.5% > haste. Does this mean, keep those two 7.5% percent above whatever your haste is or just in general they are better than haste and to not worry about haste? Good question. No, Hit and Expertise numbers have no connection to your Haste number. Once you have each of Hit and Exp. to 7.5% then you can start reforging for Haste.